Thirty years ago this month the British tabloids were full of stories about mysterious fires breaking out in houses across the north of England – and the only survivor was a mawkish print of a crying boy. 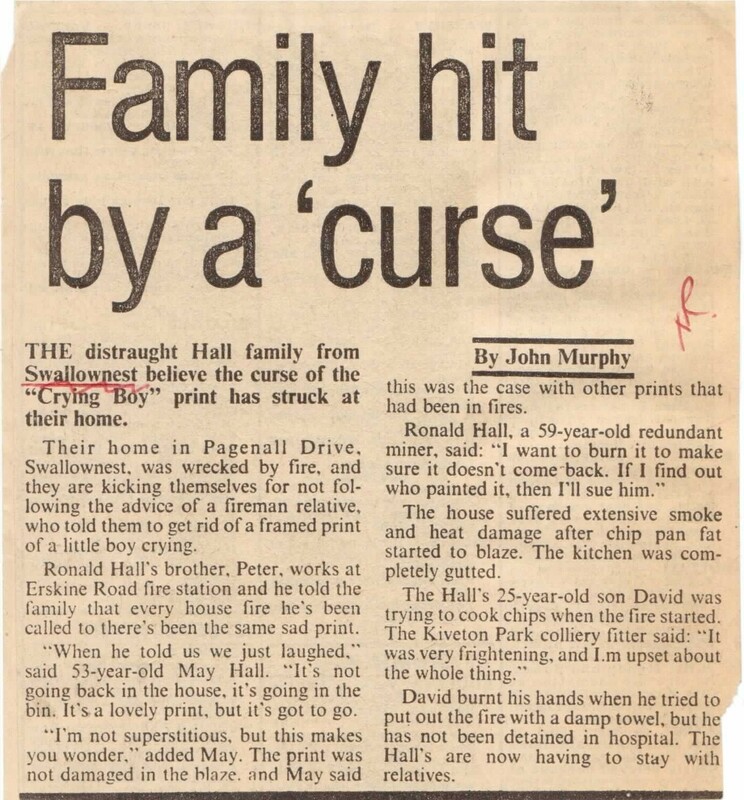 The legend began in September 1985 when my former paper, the Sheffield Star, sent reporter John Murphy to follow-up a routine calls story about a fire that badly damaged a terraced house in a South Yorkshire mining community. A cheap, mass produced painting of a crying toddler was found in the remains, perfectly intact. Murphy did a bit of digging and discovered fire fighters at Rotherham’s Erskine Road station had compiled a list of 50 similar fires where the painting had been found. In each case the kitsch prints – attributed to an obscure Spanish artist known as Bragolin – were left unscathed by the devastation around them. 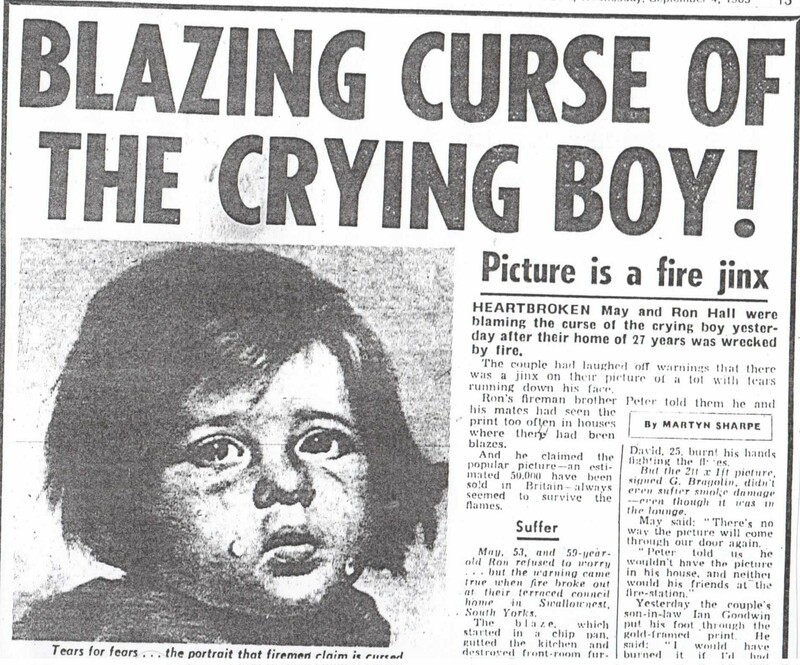 The Curse of the Crying Boy was born and Kelvin McKenzie, who was editor of The Sun, was soon fanning the flames with a string of stories telling of families fleeing from the evil painting. It emerged that more than 50,000 versions of the print were sold in the UK at branches of Boots and Woolworths. Some were crude copies of sentimental portraits of children with sad, big eyes painted in the 1960s by American artist Margaret Keane, the subject of Tim Burton’s 2014 biopic, Big Eyes. News of the ‘curse’ led scores of people to report house fires where the painting, or versions of it, survived. By October the tabloid was encouraging worried readers to send their prints to Sun HQ for destruction on a Halloween bonfire. But the urban legend was too good to die and from the mid-90s the Curse of the Crying Boy became an internet phenomenon. Elaborate versions of the legend have appeared online, seeking to explain who the boy was and why the paintings were cursed. In 2010 comedian Steve Punt quizzed McKenzie for an episode of his BBC Radio 4 series Punt PI. In suitably playful mood, he admitted the Crying Boy was born on a slow news day when a filler from a regional news agency, based on Murphy’s story, caught his eye. The fact that fire fighters – credible witnesses – appeared to confirm the story was enough for him. Too good to check? Read more about the Crying Boy legend here. This entry was posted in Uncategorized and tagged Big Eyes, Bragolin, crying boy, curse of the crying boy, Halloween, Kelvin McKenzie, Margaret Keane, Rotherham, Sheffield Star, South Yorkshire, Steve Punt, The Sun, Tim Burton, urban legend. Bookmark the permalink.